Over the years, I have often been an advocate of rooting android phones. Virtually all the android phones I have used, I have rooted. But considering the issues we are currently facing with MTK android phones like infinix, Tecno, Innjoo and the rest, it’s best not to root the phone if there are no special motives for it. In other words, Unroot android could become necessary. Read More: Using An MTK Android Phone, Here’s Why You Should Not Root It! For example, in the case of infinix phones, updates are released every now and then and whenever this is done, updating your phone could get it bricked if the phone has been rooted. Recently, I unroot my infinix hot note x551 android phone because I wanted to do a factory reset and when doing a factory reset on these android phones, it’s advisable to first unroot the android phone so that it doesn’t get bricked. I unroot the android and commenced the factory reset process. It went smoothly and when that was completed and the device was running smoothly, an update pop up. I decided to update the phone and voila, it got bricked with the no command error. The phone is still currently in coma because in the process of trying to unbrick it, it got hard-bricked. This caused it not to even turn up at all. Will write a comprehensive solution when the phone chooses to revive back. Back to the matter, if you do not have any special motive like having full control over your android device in terms of technical abilities, it’s best not to root the phone. 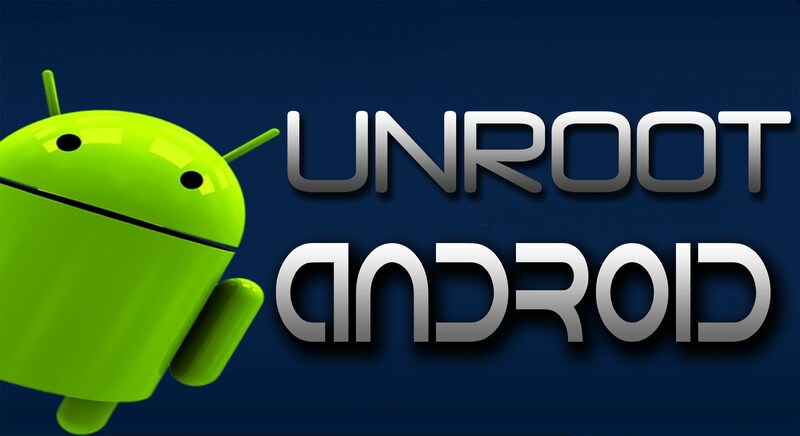 If you have already rooted it and looking forward to removing unroot permission your android phone, I am here to help. Earlier before now, I had published a tutorial which talked on how to perform this same function using SuperUser app. If the SuperUser app didn’t work for you, you can try using kingroot by following the tutorial herein. Please note that using Kingroot in unrooting an android phone in most cases, will only work if the device was actually rooted using the Kingroot app. If you used a different app in rooting your android phone, it’s best you revert to that same app and look for the unroot option. Alternatively, using the comment session, you can share the name of the rooting app you used and I will try to provide a solution to unroot your android. Launch the latest version of Kingroot app (version 4.5.0107 beta3), tap on the settings gear which is located at the top right side of the page. Under the settings page, tap on Root Authorization setting > Remove Root Permission > tap on Continue. A confirmation message shows up afterwards, tap on OK. Wait for a while and you should get a notification stating ‘Root as been removed‘. Wait a little longer and the kingroot app will automatically close. You’ve performed the above settings and you are skeptical as to whether or not, the unrooting process was successful? Here is a way to verify or confirm unroot successful. Reboot your device and use the Root Checker Basic app (download from playstore) in verifying root permission. At this point, you should get a notification saying ‘Sorry! Root access is not properly installed on this device‘. Take a deep look at the images above. The image at the right signifies when the device was rooted. The image at the left signifies when the same device became unrooted. You can also look at the time difference as well as the battery level. Looking at the time difference properly, the process took just about 3 minutes. Meaning, it’s a breeze and you shouldn’t experience any hustle. I used the Infinix Zero 2 for this particular tutorial. Hi, after I unroot the device that was rooted by Kingroot (did not uncheck the “save Root data”) and system is now in brick with looping on boot. What can I do now? Now I found this useful article. I always read articles about rooting android devices, but rarely found an article like this. Now I can finally unroot my phone and update it to a newer version. Thanks a lot! If you used kingroot in initially rooting the phone, YES. Here’s how to get it done. It’s Said Failed to Unroot Becuz something Wrong With The system?, please How To Fix It? Will i lose any pictures, contacts, apps after unroot? No, you won’t lose any of those after unrooting. I rooted my vivo y28 by using kingroot 4.9.2 apk. But now I want unroot it. When I do unroot it show root permission removed and when I restarted n chek in hard rest menu it show it’s rooted, not show unroot. I did everything but my but my google playstore refused to connect what should i do? I’ve rooted my phone with kingroot (Y6 orange/huawey) and delete apps like aviate yahoo, and “accueil orange”. Then an upgrade has been available for the system, and I tried to unroot my phone. It failed. So i Reinitialized my phone, and now i d’ont have any acces to my google account (don’t now why, i cannot sign in), i don’t have any access to any home. That’s a little bit annoying, don’t u have any solution for me ? If I unroot it with KingRoot does it delete all my messages, apps, etc? Anonymous, No it wouldn’t. It will only remove the root privilege. i rooted my phone with kingroot 4.0.2 and now when i click remove root it just closes and when i reboot my phone it show successfully root obtained. what should i do? My son downloaded kingroot for his galaxy tab 10.1. thenight his Google apps quit working. Then I did a factory reset. Now Google account won’t sync. I’m a tech dummy. Can u help. I’ve tried to search the Internet but I don’t know the lingo. I used the kingroot app on my galaxy grand prime g530w ( not the computer version ) How do I unroot if I can’t boot my phone? It just says ‘custom binary blocked by frp.’ I rooted using the kingroot apk app. How can I unroot my phone so that it boots normally? I rooted my Canvas Nitro but I am not able to use Lucky Patcher. It does say that Root is properly installed on your device. I have unrooted it should I root again with same method or use some other way. Im asking if , can this be fixed? 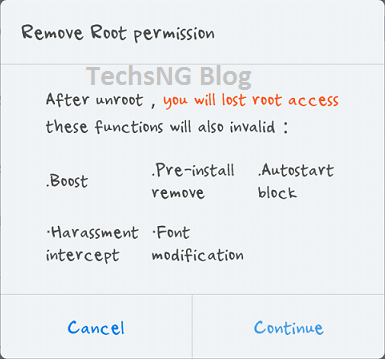 how can i upgrade my Tecno boom j7 to lollipop without bricking… ? Its not completely removed from your device, System Update always failed after unroot. Its not completely remove from your device. 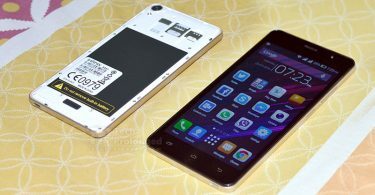 after unrooting kingroot from my lenovo a6000, update system always failed. Thank u in advance, please can u provided the we can download the 4.5 beta so I can unroot my own. Hy, after unrooting d device, can I carry out upgrade without fear of my phone being bricked? Yes Sunny. But i would advise that you are sure of what the update is all about before you choose to update.